The splashback in your kitchen will become the focal point for family and guests alike, so choosing the right splashback is paramount. When it comes to colours, designs and materials there is plenty to choose from so it depends on what look you’re after, how much you want to spend and how long you want it to last as to what you choose. With that in mind let’s look at materials. When it comes to what to place in your kitchen you can choose from Glass, Perspex, Tiles or Stainless steel to name a few. To start with unless you want a very industrial look to your kitchen stainless steel will be ruled out. It not only can cheapen the look of your space, but it marks easily with fingerprints and smears and is harder to clean than all other options. The old style splashback was always tiles. Back when these were popular this was really your only option. Nowadays tiles are making a comeback and people still think they are the cheaper alternative, but be careful with this assumption. They are most commonly used when you want to add a federation look and feel to a modern house. They also give you a great range of colour and size combinations to help you create a space that is unique to you. The downside of tiles is that a tile is needed and may charge you small fortune to do the job. Also having grout in your kitchen that will soak up the stains and can be quite difficult to clean be not a great option. There are a growing number of suppliers that are jumping on the bandwagon of perspex DIY splashbacks. These are now seen as a great alternative to glass as they are much cheaper and you can install them yourself leading to a good cost saving. The biggest downfall of perspex is that it’s not as easy to work with as they would like you to think and to get those clean cuts around windows and at joins is quite difficult for the general handyman. The other thing to remember when looking for perspex splashbacks is their heat rating. If you are running a gas cooktop you may find out a that you also need stainless steel behind your cooktop as the perspex will not be heat resistant enough to cope with gas. When you talk about glass the first thing everyone seems to jump to is the glass splashback cost. It is correct the glass splashback price can be higher than the aforementioned options, but be careful that you don’t just look at the upfront costs. 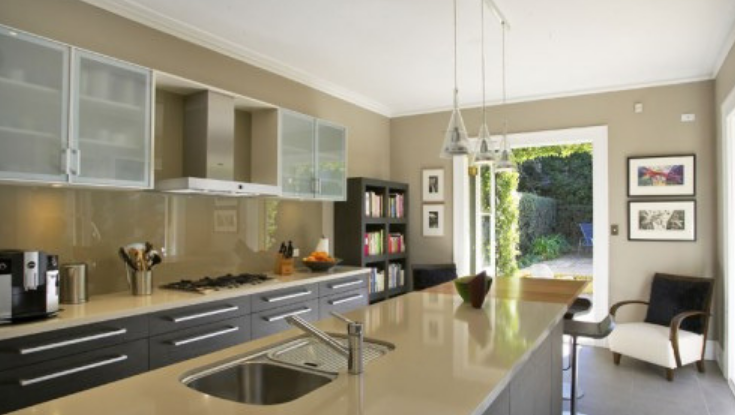 When pricing up your splashback options make sure you also look at long term cost. If you’re simply looking for cheap kitchen splashbacks then glass may not be for you, but let’s be honest here. You’ve probably just spent quite a bit of money installing the kitchen of your dreams and in respect to the cost of that, a glass splashback it will probably be relative to the overall cost. Also, if you look long term, your maintenance costs will be much lower as there is no grout or heat issue and most kitchen splashback panels will come with 10 year warranties and your choices of colours and designs are endless. As far as cleaning goes, glass outweighs every other form of splashback as it is a non-porous surface that can be wiped clean of grime and oil. You could go all the way from a clear glass splashback to a tile design in glass. Decoglaze have a full gallery of kitchen splashback designs to help with your inspiration.